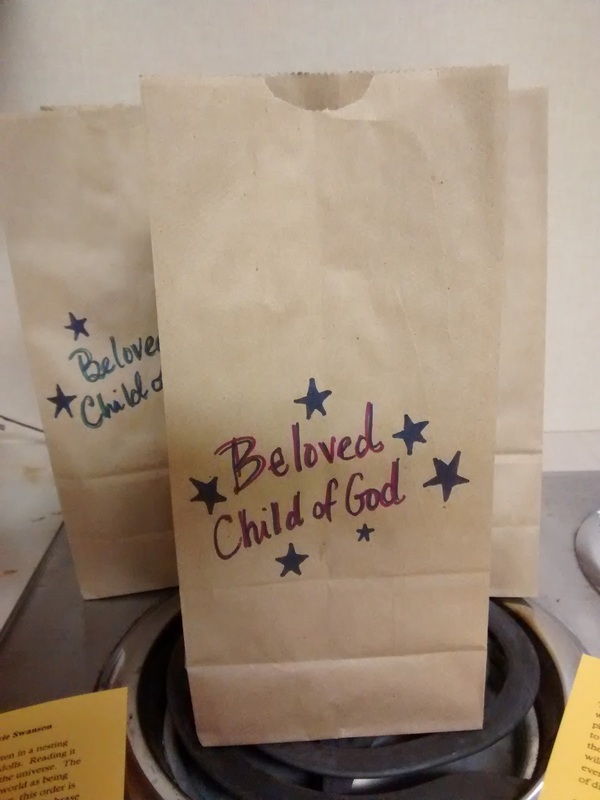 I sat at the kitchen island prepping brown paper bags with the words, "Beloved Child of God." Over and over I wrote with permanent markers in one color after another. Everyone who attends the As a Child Retreat will get a bag. Meant to trigger memories and fun, each bag holds playdoh, a bouncy ball, a lollipop and a colored pen. For months, I've been planning, praying, gathering materials for this retreat and now the day is almost here. But last week, as I wrote those letters over and over again, I felt a creeping dis-ease that multiplied throughout the day. By evening anxiety was spinning a sprawling web through my insides as I tried to explain to my husband how I felt. "I feel insecure," I said. Naming it helped, giving words to the way self sometimes crumbles in on itself, searching for something, anything solid to stand on. Finally, tired of sinking in my own stew, I asked my husband, "Is there anything you can say to make this better?" Without a second's pause, he replied, "You're a beloved child of God too." Simple truths have a way of cutting right through the haze, don't they? I gave my husband a small glare. By that point I was fairly attached to my pity party and, in the end, I envisioned a bag of chips being involved. Later he told me how funny it was, watching me writing the same words over and over again, but not letting them sink in. Yes, that's the heart of it. Isn't it? Those four words offer the most solid ground I know. Sweet husband helping you cut right through your insecurities to the truth . Love when our spouses are mirrors! Reminding us who we really are! I love when God gives us moments like this with our spouse (or anyone, really). Moments of clarity. Of reminding us who we are. Love those bags!